Tzav (צַו‎) — Hebrew for “command,” the sixth word in the parsha) is the 25th weekly Torah portion in the annual cycle of Torah reading and the second in the Book of Leviticus. The parsha teaches how the priests performed the sacrifices and describes the ordination of Aaron and his sons. The parsha constitutes Leviticus 6:1–8:36 (6:8–8:36 in the KJV). This week’s haftorah touches on the subject of the Sacrifices and the Responsibility of the Priests, the main topic of the week’s Torah portion. The prophet Jeremiah in chapter 7 parallels the Torah portion about the Priest’s and their responsibilities and describes the failure of the Priests and we discuss the job of the Priesthood to Teach and Live Torah, Bless God’s People Israel, Pray and Intercede for the People, and Warn those in error and call them to Repent! Taken from Jeremiah 7:21-8:3; 9:22-23. God tells the prophet Jeremiah to rebuke the Jewish people, saying that His primary intention in taking their forefathers out of Egypt wasn’t the sacrificial offerings, rather in order that they observe the commandments. But despite the fact that God repeatedly dispatched prophets to admonish the people, “They did not obey nor did they incline their ear, but walked according to [their] own counsels and in the view of their evil heart, and they went backwards and not forwards.” God further informs Jeremiah that the people will also not hearken to these words that he will speak to them now. 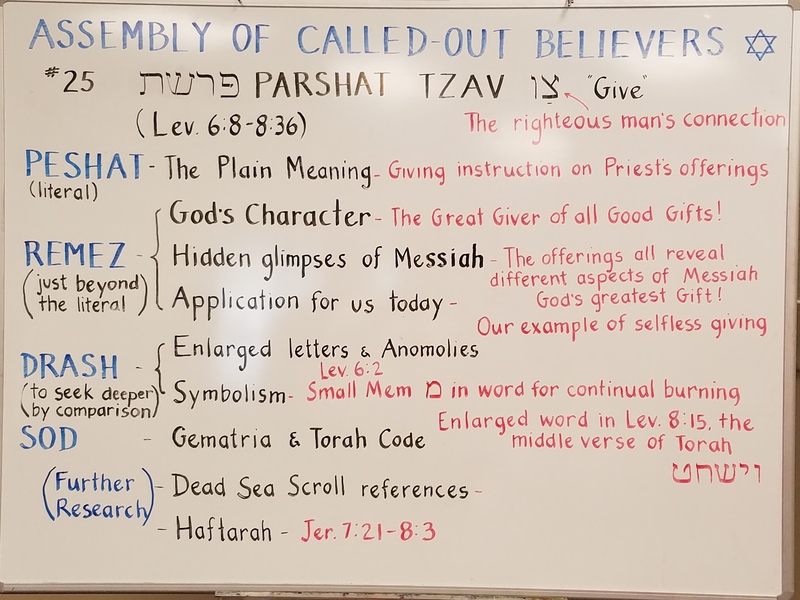 Torah Parashah teaching with video and audio and illustrations by Pastor Isaac. © 2018 Assembly of Called-Out Believers. Use by Permission.